I am 5’3″ and 110lbs. I know this because I went to the doctor today and they weighed me (I don’t own a scale anymore). I’m pretty shocked to see that number on the scale considering I am 34 years old and have given birth to three children. There is only one other time in my life I have weighed 110lbs. I was 23 years old and 1 year out of college. I had a full time job as a research assistant at a huge prestigious university and had just broken up with my longtime boyfriend. I had been struggling with bulimia for four years by this point. To deal with the stress of being on my own for the first time, working a full time job, and attempting to overcome a debilitating eating disorder I started working out and limiting my calories. I started road biking. I would go on 50-100 mile bike rides on the weekends and do 1-2 hour cycling classes during the week. I had a rule that i could eat whatever I wanted as long as it was no more than three hundred calories and I had to wait three hours before I could eat another three hundred calories. I was overexercising and severely restricting my calories. But for awhile I was not bingeing or purging so I thought that what i was doing was helping. I thought I was being healthy. After three months of torture (and believe me, it was torture! I was miserable!) everyone started noticing how thin I was getting. That is when I decided to weight myself. I was 110lbs. The more comments people made, the more determined I was to stick with my “diet plan.” The problem was, it just wasn’t sustainable. I started bingeing and purging again because my body was so starved for calories. Eventually I hit rock bottom and had to admit to myself that I had a problem. I had a severe eating disorder and I needed to seek help. At 23 I started the long (and I mean LONG!) road to recovery. Start your transformation today! Click to get started. Here I am now, 34 and 110lbs once again. Only things are VERY different now. 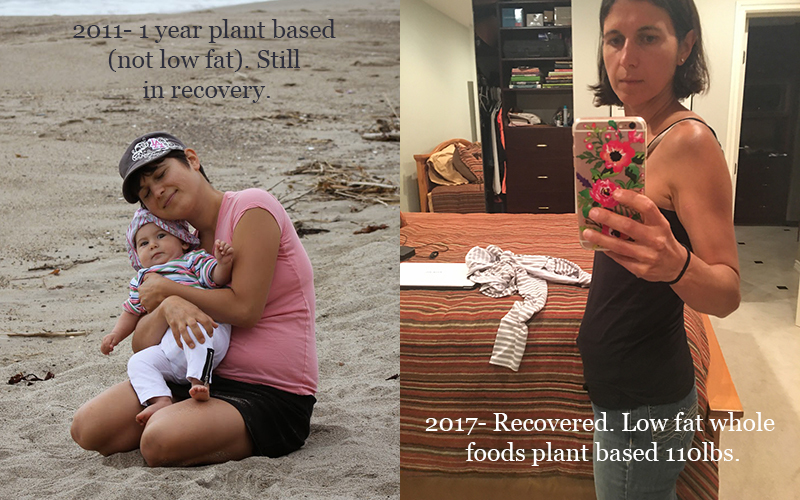 I have been eating a vegan diet for 9 years and a low fat whole foods plant based diet for two years. I rarely exercise (unless chasing and carrying my kids around counts!) and instead focus on living a life that includes constant movement. And I never never restrict my calories. I fill my belly up all day with fresh fruits and vegetables, rice, beans, nuts, and seeds. I enjoy eating and cooking and I focus on how I feel instead of how I look in the mirror. Over the past seven years my weight has fluctuated as I have grown and given birth to three beautiful kids. But now, two and half years after the birth of my last child my weight has settled to its ideal number: 110lbs. It was effortless, it was easy, it was natural, and so surprising! My road to recovery from bulimia, calorie restriction, and overexercising was a long one and it took a long time for me to get back down to my ideal weight but I wouldn’t change a thing. I am no longer sad, depressed, scared, anxious, starving, and exhausted! I now feel satisfied, happy, calm, energized, and so confident in myself. I am so grateful that I was able to find and ultimately stick to a whole foods plant based diet. It changed my life for the best.